When you think of vinyl flooring, you probably picture those glossy squares that covered your mom’s kitchen floor or the peel-and-stick tiles found in bathrooms or hallways. Many local flooring companies have seen the trend to luxury vinyl in their showrooms and an increase in interest from those remodeling on a budget. It is reasonably easy to install yourself, which saves a good amount of cash when you don’t have to call a pro to have it done. If you are not worried about the cost, luxury vinyl has many other benefits. The tile-look products can be grouted, mimicking the appearance of ceramic or stone, and the wood-look slats feature unique textures and rich colors. Vinyl is softer to walk on compared with standard tile and holds up to spills and large pets better than hardwood. An advantage of luxury vinyl is that it isn’t damaged by moisture, as there is no wood inside to swell or buckle. When remodeling, luxury vinyl can be glued down or floated. Individual tiles and floorboards can be clicked together and then installed without glue, to float on special underlayment. Floating floors can cover up minor imperfections in the subfloor during a renovation. Luxury vinyl is thinner than hardwood, a great option when installing on the required underlayment. 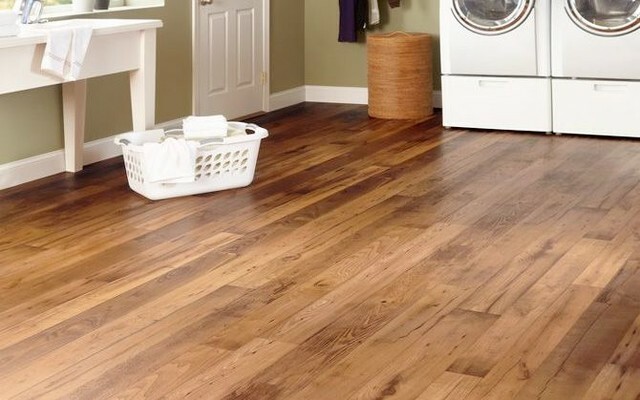 When remodeling, it’s much easier to match the thinner vinyl product up with existing floors throughout the home. Whether you think luxury vinyl is the right product for you or not, it is a hot trend you should check out!